Hello First Order enthusiasts! I had a quick question about the TK designation for First Order Troopers. In the film, The Force Awakens, the traitor FN-2187, given two letters at the beginning of his trooper ID number. Apparently, there were a number of other troopers in Captain Phasma's FN Training Corp that were also given the "FN" designation. In the newly released book "Phasma" the FO troopers also have letters at the beginning of the trooper ID number. Does the 501st plan to adopt this policy for First Order Troopers so that all of the First Order troopers don't start off with "TK" or does the 501st plan just to stick with the "TK" designation for the White Armor Stormtroopers? I'm fine either way, but I figured I would ask. Kill'em with humor...exactly. Stormtroopers not being able to hit anything is popular joke with a lot of Star Wars fans. There are memes galore on the internet about that topic lol. I can see how it can bother someone when they are suited up. Just remember, it's all in fun and don't get too flustered. Some people may be heckling you to be mean and others could just be picking at you in a nice way. Here are some good comebacks! (Have fun with the people picking at you) "Hey Stormtrooper, you can't hit anything!!!" I stared at the Death Star Laser too long Neither can Han Solo...Anymore We don't need to hit anything, we have Darth Vader (good one if Vader is trooping with you) Tell that to the villagers on Jakku. Oh yeah? Alderaan thought that too. Silence Rebel Scum! HOWTO: Magnetic Plug and Socket. No more velcro. I think tapatalk is so popular because its easier for some to post pictures from their phones. There are more people with smart phones than with laptops and desktop computers. I think that is another reason the mobile app is so popular. PC's have been declining since 2011. A survey in 2015 concluded that 80% of online adults use a smartphone. Google also stated that in at least 10 countries, mobile use of their site was larger than desktop usage. I am fortunate enough to have a laptop and a smartphone. Personally, I think its easier to post a thread using a computer. Posting pictures however, especially for people who aren't tech savvy, is much easier through tapatalk. By the way, if I haven't said this in another thread somewhere, a big thank you to Web Team for the site. I find it very easy to navigate and post on. Way to go Web Team! 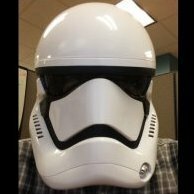 Jayben Kenobi replied to bromeo's topic in Getting Started - Read this First! I also use Flickr so I want to perform a test to help the I.T. Team diagnose the issue. I will try to up load a photo on this site from Flickr using my desktop computer. Test Photo: From my desktop computer I can see a Stormtrooper from the New Film The Last Jedi holding a futuristic looking battle ax of some type. Let me know if this post is view-able on your end. Thanks!